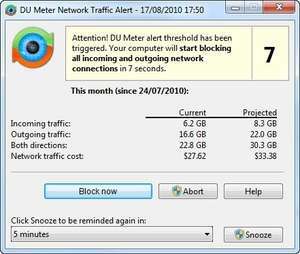 DU Meter is a network monitoring and bandwidth monitoring application which has become well known among Internet users both in North America and abroad. This application takes up very little system resources and is pretty small in size. It displays a ton of different information about your network. Besides the main window which includes a visual, graphical representation of current network usage, it also records this data and can display statistical information about how much network resources are being used. DU Meter 7.24 is a shareware program and can be used as a demo to try the software until the free trial period has ended. A full version of the program is available after the trial period ends. For security reasons, you should also check out the DU Meter download at LO4D.com which includes virus and malware tests. Additional screenshots of this application download may be available, too. DU Meter has a presence on social networks.